GS1-128 shipping labels are logistic labels which enable shipment visibility within a supply chain. 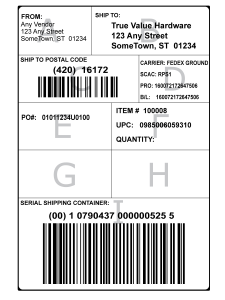 GS1-128 shipping labels are typically broken down into zones. 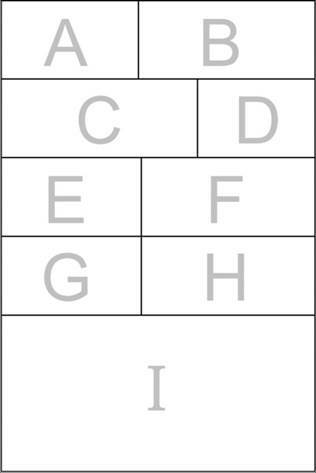 Each zone is defined by either the text or barcode information which is included in the specified area. The bottom zone (Zone I) is commonly used to host the SSCC-18 barcode, which is used as a ‘license plate’ and correlates with GM MAN segment in an ASN (856). Other zones are defined by the individual trading partner to contain data or barcodes which support the needs of their supply chains. Different supply chains will utilize different versions based on the specific needs. For example, the JC Penney GS1-128 Shipping Label example below is placed on cartons which are used for automation sortation on a conveyor using fixed mounted scanning equipment vs. the True Value sample label below is used to identify inbound pallets, and is scanned manually using a hand scanner. The primary purpose of utilizing GS1-128 Shipping Labels is to identify a shipment with data being received and transmitted by EDI. Specifically, fields such as the Purchase Order, Ship To Location and sometimes item information is received in the PO (850) and are on many GS1-128 Shipping Labels. Each shipment has a supplier assigned license plate (SSCC-18) which is transmitted in the ASN (856). 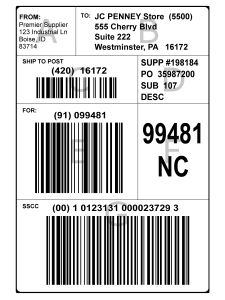 The SSCC-18 is placed in Zone I on a GS1-128 Shipping Label. Since data being received and transmitted by EDI are essential components of a GS1-128 Shipping Label, a company’s EDI solution will determine which GS1-128 Solution is needed. There are a variety of web-based EDI Solutions which allow users to receive and transmit EDI documents using an online portal to manage EDI accounts. Many of these solutions include a GS1-128 shipping label print function, which prints labels using either a thermal or laser printer attached to a computer that is online. The following e-commerce companies offer web-based EDI Solutions: DiCentral, GXS – OpenText, SPS Commerce, Covalent Works, and DataTrans. Typically, companies using a web-based EDI Solution can install on-demand (thermal or laser) printers at their shipping locations to enable them to print labels when needed. Bar Code Graphics offers supplies for companies needing to print in-house. For companies who do not want to print labels in-house, Bar Code Graphics maintains a label printing service bureau with exceptional same day shipping services (for most orders). EDI translation software packages enable companies to receive and transmit EDI Documents with their trading partner. This software enables companies to leverage EDI data with other in-house applications which support and drive their businesses such as; production, WMS, accounting etc. Integrated with internal business operations. Companies using an in-house EDI Solution typically install barcode label printing software and on-demand (Thermal or Laser) printers at their shipping locations to enable them to print labels when needed. Bar Code Graphics offers software and supplies for companies needing to print in-house. For companies who do not want to print labels in-house, Bar Code Graphics maintains a label printing service bureau with exceptional same day shipping services (for most orders).